William Hard. Raymond Robins' Own Story. 1920. Contents. Chapter Four. A RED GUARD was walking through the Most Holy Gate of the Kremlin, in Moscow. Walking through it, he took off his hat. Passing a little shrine, he stooped and kissed the icon in it. He moved his rifle from his right hand to his left, and crossed himself with his right. "Do you believe in Christ?" "Do you believe in the Church?" The Red Guard clattered his rifle to the ground. "No, no!" he exclaimed. "No, no!" And he went on to say emphatically why. He said the Church was the agent of the Czar. He said the Church was the spy of the Czar. He said the Church was the police-dog of the police of the Czar. It bothered Robins. It reminded him too much of an incident that had happened to him once in Australia. He had spoken in America for the Men-and-Religion-Forward Movement in a multitude of cities, and he had spoken in colleges in America, in North and South and East and West, to a long series of mass-meetings of students, on the theme always of a serving Church in a serving state, of a Church and of a state serving the daily work-hour needs of people. He had gone then on a journey round the world, still speaking on that theme and on themes like it. He came to Australia. There, at Melbourne, a delegation of laborleaders, including Cabinet Ministers of the Labor government, waited on him and formally withdrew an invitation they had extended to him to address a labor meeting. Why? Because they had learned that he was present in Melbourne as the guest of an organization of clergymen. Greatly disturbed, Robins went to see the Prime Minister. The Prime Minister was friendly, but firm. "Brother Robins," said he, "you cannot expect it to be any other way in Australia. When we had our big fight here, the clergy lined up almost solid with the labor-skinners." He busies himself with reports and accounts of departments on his desk and receives visitors for stated lengths of time----ten minutes, five minutes, one minute. He is likely to receive them standing. He speaks to them with the low voice of the man who does not need to raise his voice. Robins could never visit Lenin in the Czar's High Court Building without thinking of that execution and of the sanction given to it---and to all such executions---by the Russian State Church. Back of the gallows, generation after generation, in every part of Russia, stood the priests, with their vessels of gold and their vestments of lovely weavings, and with their icons, preaching obedience to autocracy and giving the word of God to back the word of the Czar, and blessing the hangman. He said to Robins: "We may be overthrown in Russia, by the backwardness of Russia or by foreign force, but the idea in the Russian revolution will break and wreck every political social control in the world. Our method of social control dominates the future. Political social control will die. The Russian revolution will kill it---everywhere." "The district of Baku is oil. Oil makes Baku. Oil rules Baku. Our representatives from Baku will be elected by the oil industry. They will be elected by the workers in the oil industry. You say, Who are workers? I say, The men who manage and the men who obey the orders of managers---the superintendents, the engineers, the artisans, the manual laborers---all the persons who are actually engaged in the actual work of production, by brain or hand---they are workers. Persons not so engaged---persons who are not at labor in the oil industry, but who try to live off it without labor, by speculation, by royalties, by investment unaccompanied by any work of management or by any work of daily toil---they are not workers. They may know something about oil, or they may not. Usually, they do not. In any case, they are not engaged in the actual producing of oil. Our republic is a producers' republic. "You will say that your republic is a citizens' republic. Very well. I say that man as producer is more important than man as citizen. The most important citizens in your oil districts---who are they? Are they not oil men? We will represent Baku as oil. "Similarly, we will represent the Donetz coal-basin as coal. The representatives from the Donetz basin will be representatives of the coal industry. Again, from the country districts, our representatives will be representatives chosen by peasants who grow crops. What is the real interest of the country districts? It is not storekeeping. It is not money-lending. It is agriculture. From our country districts our Soviets of peasants will send representatives chosen by agriculture to speak for agriculture. Lenin has absconded to Finland with 30,000,000 rubles in gold from the state bank. The Russian revolution has been betrayed by false leaders. But there is hope now for Holy Russia. The Little Father is coming back. The Grand-Duke Nicholas Nickolaievitch is advancing from the Crimea with 200,000 brave, true Russian soldiers who will save Russia from the Bolshevik traitors. Robins turned and hurried back to his hotel to get his sleigh. He drove to Smolny, and waved his card at the doorkeepers and ran up-stairs. In the corridors were crowds of commissioners and clerks and guards, running, shouting, and running again, getting ready for something very immediate. Machine guns were being unhooded. Their cartridges were being run into them. The crowds, with the guns, surged over to one side of the building. Robins looked out from that side across the yard of Smolny, toward the Viborg---the Viborg workmen's quarter. Two streets came from there toward Smolny. They were black with two streams of armed workmen flowing against Smolny. They would overwhelm Smolny and clean it out and then flow to the front against the Germans. Such was the cry. Robins drew back from his window and worked his way along a corridor of dense panic toward Lenin's private office. He looked in. Lenin was there. He was receiving telephone messages from the front. He was receiving personal reports from couriers. He was writing orders and sending them out. He was working without pause, as usual, and, as usual, without haste. He seemed quite unaware of any crisis. Lenin jumped to his feet. For just one moment he, too, was excited. "No! No!" he said. And again he said, "No! No!" angrily. "Shoot them? We will talk to them. Tell their leaders to come in." Somebody went to tell them. Lenin went back to his messages and his orders. The leaders of the mob began to come in and began to fill Lenin's office---workmen, in workmen's clothes, each with a bayoneted rifle in his hands and with a magazine pistol at his waist---workmen---soldiers---the men Lenin had to rely on---the armed revolutionary proletariate---the nucleus of the future Red Army of Lenin's Russia. They grounded their rifles. Somebody said to Lenin: "They are here." The outer door was closed. Lenin rose and walked toward his visitors. "Comrades," he said, "you see I have not run away. Comrades, I was fighting for the revolution before some of you were born. I shall be fighting for the revolution when some of you are dead. I stand always in danger. You stand in more danger. Let us talk frankly." "Comrades, I do not blame you for not always trusting your leaders. There are so many voices in Russia to-day! I wonder that you have trusted us as much as you have. "Among honest revolutionists to-day there are two voices. One of them is right. One is wrong. "Would that be dying for the revolution? Comrades, when we die, let us die really for the revolution. Let us die when by dying we can win victory for the revolution. "Comrades, my voice is right. They tell you I will make a shameful peace. Yes. I will make a shameful peace. They tell you I will surrender Petrograd, the imperial city. Yes, I will surrender Petrograd, the imperial city. They tell you I will surrender Moscow, the holy city. I will. I will go back to the Volga, and I will go back behind the Volga to Ekaterinburg; but I will save the soldiers of the revolution and I will save the revolution. "Comrades, what is your will? "I will give you now a special train to the front. I will not stop you. You may go. But you will take my resignation with you. I have led the revolution. I will not share in the murder of my own child. "Comrades, what is your will?" "Lenin! Lenin! Lenin!" The room held no other sound. "Comrade Lenin! Comrade Lenin!" It was a judgment delivered. Having delivered it, the judges picked up their rifles and marched out of the room and down the corridor, still delivering their judgment. "Comrade Lenin." Such was Lenin face to face with his followers. Such was Lenin the personal leader. "You will notice, comrades, that in many ways this is not our decree. In many ways this is the decree of some of our political opponents. But we have noticed the answers given by the peasants to the questions sent out to them. We cannot settle the problem of the land without regard for the ideas of the peasants. Time alone can tell, life alone can tell, whether we are right or they are right. In the mean time we must remember that we cannot impose our ideas when it is impossible to impose them. We must keep our ideas to put into force when we can, not when we can't." "I know that many things are done in haste in a revolution. I know they must be. I cannot make a revolution anything but a revolution. But our task has changed. It has changed with success. A few months ago we had to bring the revolution in. Now we have to make the revolution work. The formula then was, 'All Power to the Soviet.' The formula now is, 'Labor Discipline.'" He went on then to the writing of his message, in which he said that all persons not working must be obliged to work and that middle-class specialists must be hired, at any salaries necessary, to give technical direction to the factories of Soviet Russia. His critics took him to task at a great meeting of Soviet representatives. The hall was filled for hours with cries of "Bourgeois Lenin" and "Czar Lenin" from the extremists of the Left and with serious hostile arguments from speakers moderate but alarmed. At the end, when the night was far spent, Lenin rose to reply. He said that all the arguments made against him could be divided into a certain number of classes. He would answer them class by class. He proceeded to do so. He spoke for perhaps half an hour. He got a vote of confidence as unmistakable as the vote from the Red Guards in his office at Petrograd. He returned to the Kremlin and continued to pursue his policy of "Labor Discipline." He said, "I will cause a sufficient number of men to work a sufficient number of hours at a sufficient rate of speed to produce what Russia requires." It was a sufficiently Russian remark. One day a man---an American---came to Robins in a great emergency of trouble. "I'm going to be ruined," he said. "Certainly they work. We're getting ten to twenty per cent. more product per man under Lenin than we did under Kerensky." "Listen! This workers' control may be all right in the factory. But now they're going to put it into the buying and selling. They're going to put it into the office. It's all wrong in the office. It won't go. But they've sent us an ultimatum. I tell you it'll kill us." "I agree with you," said Robins. "What do you want me to do?" "Well, they say you can see Lenin. See him." Lenin listened while Robins told him that this American company certainly has a lot of manufacturing knowledge, and that it is willing to go on using that knowledge in Russia and giving Russia the benefit of it if only the Bolshevik government will compromise and not insist on putting workers' control into the office. The compromise was made. Lenin wrote out an order stopping the putting of workers' control into the office. Robins met the manager of that factory again, some time later, and asked him how he was getting on. "All right," said he. "First rate." "Tell me. If you get out of Russia, who will take your place making harvesters for Russia? " "Stay in Russia. Stick. Russia has a revolution. Lenin did not make it. He has led it, but he did not make it. Yet he does lead it. And he leads it all the time, as much as he can, toward work---toward the task of actually earning a living in a living world. He is calling for engineering advisers now, for factory managers. To get them he is willing to negotiate, and he has tried to negotiate with foreign 'bourgeois' governments, and especially with the United States. To get them he is willing to compromise, just as he has compromised with my American business man. If we break with him altogether he will find it more and more difficult to make his government compromise with American business men. If we go away altogether, and leave Russia, he will make his compromises and get his factory managers where he can---and the quickest and easiest place is Germany. To fight Lenin is to play the German game." "About this May-day parade, on the first of May. My men tell me there is going to be a lot of trouble. Why do you have the parade? It will cost a lot of money; and Russia is hungry, and poor; and there will be shooting and murdering. Besides, what has it got to do with work?" Lenin looked really quite surprised. "We have to have work," he said, "but we have to have May-day. On every May-day past, for many years, we marched in honor of the revolution to come. 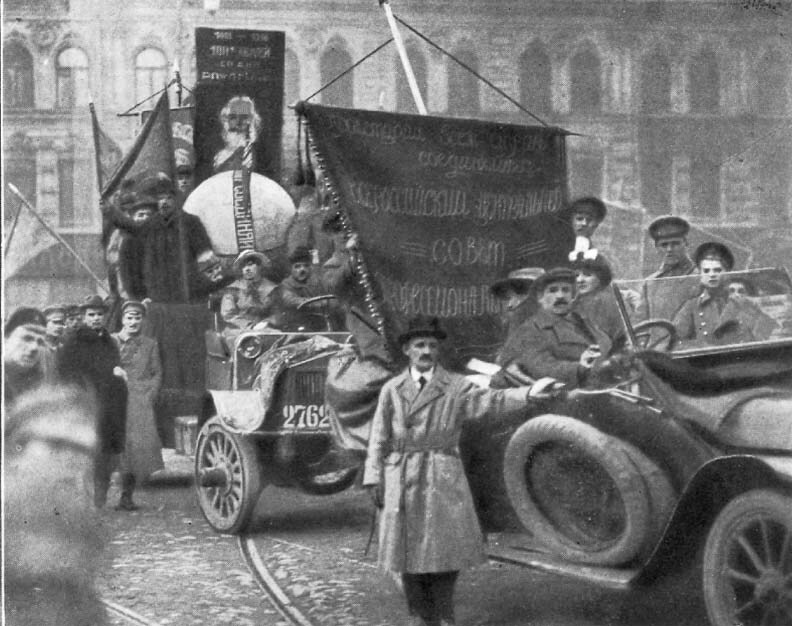 Now, on the first May-day of the Soviet republic, we march for the first time in honor of the revolution accomplished. It has to be. We may march without shoes, but we have to march." "It's just as I told you. There's going to be trouble. I'll give you just one case. My men saw a coffin being carried into a building on the line of march. Then they saw another coffin going into that same building. They kept on watching, and the coffins kept on coming; and now there are seven coffins in that building. And my men have taken a look at them inside. They're not coffins. They're machine guns. That's what's going to happen." Lenin, rather wearily, scratched some words on a piece of paper. Robins thought it was an order to capture and confiscate the machine guns. It turned out to be quite more. On the afternoon of the 30th of April Robins was in his room in the Hotel Europe. Some men came in. They closed the windows and sealed the fastenings of the windows. They warned Robins against breaking the seals till the parade next day was over. A regulation had been issued. It had been issued to the legally responsible "house committee" of every house along the line of march. If from that house there should be a shot fired at the parade by anybody, then the whole "house committee" would be arrested and tried. Next day forty-two thousand people marched nine miles through a city filled with revolutionists and counter-revolutionists, and not a shot was fired, and not one man or woman was hurt. It was a holiday; it was a workless day; but Lenin, after all, had not been able to forget work. He had caused certain words to be displayed conspicuously everywhere. They met Robins' eyes all day long. To Moscow celebrating the joyous overthrow of capitalism, these words everywhere said: "Labor Discipline," "Labor Discipline," "Labor Discipline." Such is the temperament of Lenin the ruler, in working pursuit of his economic social-control state. The reviewing-stand of the Moscow May-day parade of 1918 was in the Red Square, just outside the Kremlin. Along the Kremlin wall were two rows of trees. Paralleling them ran a trench-the trench in which the men who died for the Soviet revolution in Moscow lay buried. The parade, in detachments, marched along by that trench and approached the reviewing-stand---a tall stand, almost like a monument---draped in red and black. Each detachment arriving at that point stood. It turned toward the long grave of its fallen comrades. Every soldier was at attention. Every civilian's hat was raised. The "Marseillaise" was sung. It was sung by everybody and it was sung through. Then this detachment went on, and the next detachment came, and again the "Marseillaise" rose, and again the revolutionary dead were summoned to the memory of the revolution. Next to him, with the rosette on his coat, stands Jacob Peters, who has received a bloody fame throughout the world as a second Robespierre. Peters signed the death papers of the Bolshevik government. Next to Peters is Karakhan, who was secretary of the Brest-Litovsk Conference. Behind the boy soldier is Vasili Likhachev, Police and Fire Chief of Moscow, at one time a stationary fireman in New York. Between Peters and Karakhan is Capt. D. Heywood Hardy, in Red Cross uniform. At the extreme right of the picture is Charles Stevenson Smith, head of the Associated Press in Russia. Next to Smith, wearing the leather coat, is Alexander Gumberg, interpreter and secretary to Colonel Robins. Robins watched from his motor, near the reviewing-stand. He was in his American uniform, and his motor carried the American flag. He was standing beside it. Suddenly he was conscious of a stir in the crowd near him. Something was coming along, breaking through the crowd. In a moment Robins saw it. It was a motor carrying a red flag on each side of the hood and a red streamer floating from the folded top and soldiers with bayoneted rifles on the running-boards and on the front seat with the driver. In the back seat was Count Mirbach, the German ambassador. Mirbach had just arrived in Moscow. He seemed, if one might judge from his flags and guards, to feel some need of protection in Moscow. Robins had been offered a red flag for his car. He had refused it. He was carrying only an American flag. Where was Mirbach's German flag? And why so many bayonets? Perhaps Count Mirbach had read the editorial with which Karl Radek, in the official Bolshevik party paper Pravda, had welcomed him to Moscow. Most certainly he had read it. Everybody in public station read Pravda. The Ambassador of the German government has arrived in Moscow. He has arrived in the revolutionary capital. But he does not come as the representative of the laboring classes of a friendly people. He comes as the representative of a military clique which kills and robs and violates wherever its bloody imperialistic bayonets can reach. Simultaneously with this bourgeois robbery from the west, comes bourgeois robbery from the east. A reinforced Japanese detachment is landed in Vladivostok. Whining intellectuals among us, bourgeois hirelings among us, are convinced that there is no salvation for us from the tusks of imperialism approaching us from both sides. They have never believed in the strength of the revolutionary government of workers and peasants. Now they are in favor of "capitulation." They are mistaken. The revolution is only beginning to discover its forces. The liberated class has not yet risen to its full height. But it is rising even now. The problem of the government of workers and peasants becomes the problem of organizing the resistance of workers and peasants to bourgeois slavery re-entering Russia on foreign wheels. 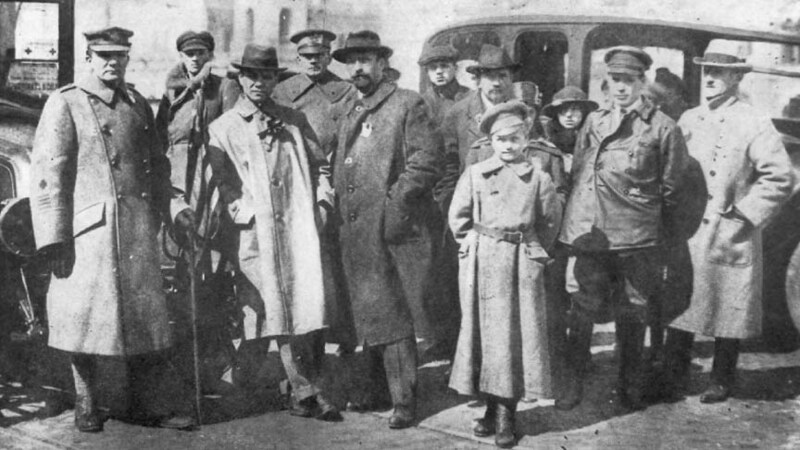 The representatives of German imperialism have entered Moscow; but, in order to get a ticket for Moscow, they have to admit the Red embassy of revolutionary Russia to Berlin. Our comrades go there as the representatives of a country which is the weakest of all countries in the military sense; but they go there as the representatives of a country morally victorious. Not one workman in Berlin will greet the ambassador of the Russian Socialist republic with the hate with which every workman in Moscow to-day greets the representative of German capital. The Red banner has been raised over the Red Embassy at Berlin. It floats there not as the banner of Russia, but as the banner of the rebellion of the labor of the world. Perhaps this editorial may have been a bit upsetting to Mirbach. Yet, in his motor, on the 1st of May, in the Red Square, he began by showing great composure---even gaiety. He watched the show with pleasure. He chatted. He showed his teeth, smiling. Then, as detachment after detachment passed, and as the exhalations of the spirit of the music and of the spirit of the summoning of the revolutionary dead began to reach him, he grew silent. He looked on with eyes fixed. After a while he seemed to rouse himself at least to resentment. He grew scornful. He seemed to sneer. His lips were pressed together in lines that said: "This beaten people! This broken people! Let them parade. We will beat them some more and break- them some more when we want to." The "Marseillaise" was sounding. Hats were off. But Mirbach's hat was on. He could not stop these Russians from parading, perhaps. But he could insult them. He could keep his hat on and throw himself back in his car. "Working-men of all countries, unite! German comrades, throw off your Kaiser, as the Russian comrades have thrown off their Czar." Mirbach leaned forward to stare at the men carrying this banner. How did these Russians dare to carry it? They were the vanquished. He was the victor. He leaned forward as if to meet them and stop them, and they came close to him; and he could see them now plainly; and he showed his teeth now again, but not to smile. Fig. 8. MAY-DAY PARADE, Moscow. Picture of Karl Marx carried on float. Mirbach sat down again in his car and threw himself back again in it; and his face took on the look of a man who sees a black gulf ahead of him, but who will drive on into it rather than not drive. "Let all these slaves march! " he seemed to say. "Let them all march, Russians and Germans and all. We will break them all." But, somehow, he could not look at them any more. He turned his eyes away and sat brooding. There was pride on him still, but there was also the mark of a great doubt. A half-hour ago he had been so confident, so suave. Now he was sullen, suspicious, angry. Against what he had seen in front of him he was hurling the answer of hate---his only answer; and he was meditating it unhappily, uneasily. To all who watched him he was sinister now---sinister and insecure. To Robins he was the image of the power of privilege, triumphant for century after century of human history, and brought now to the brink of a bottomless questioning and looking over that brink, and down into that questioning, and wondering if here indeed is the abyss, here the end. The rulers of all western Europe are now gazing into that same abyss, and gazing with precisely Mirbach's headlong hate, followed by precisely Mirbach's quaking wonder. Both the hate and the wonder, both the reckless resort to force and the helpless inward panic of fear, are the offspring, Robins thinks, of thorough misinformation, sometimes innocent and sometimes deliberate, regarding the Soviet republic. So far, Robins has tried to describe certain leading characteristics of Bolshevik power and intention. He has shown the actual authority of the Soviets even in the days before the Bolsheviks controlled them; he has shown the ruinous effect of the diplomacy of Trotzky on the morale of the German Eastern army and on the morale of the proletarian element in the German population; he has shown the willingness of Trotzky and of Lenin to seek economic co-operation and to seek military co-operation with America and America's rejection of their offers; he has shown the carefully-thought-out theory of Lenin for an economic state; he has shown Lenin's willingness to concede, to compromise, in order to make some sort of state in Russia stand---stand with organization and with orderliness; and he has shown the personal and public devotion and the utter confidence which Lenin's followers give to Lenin and to Lenin's program.